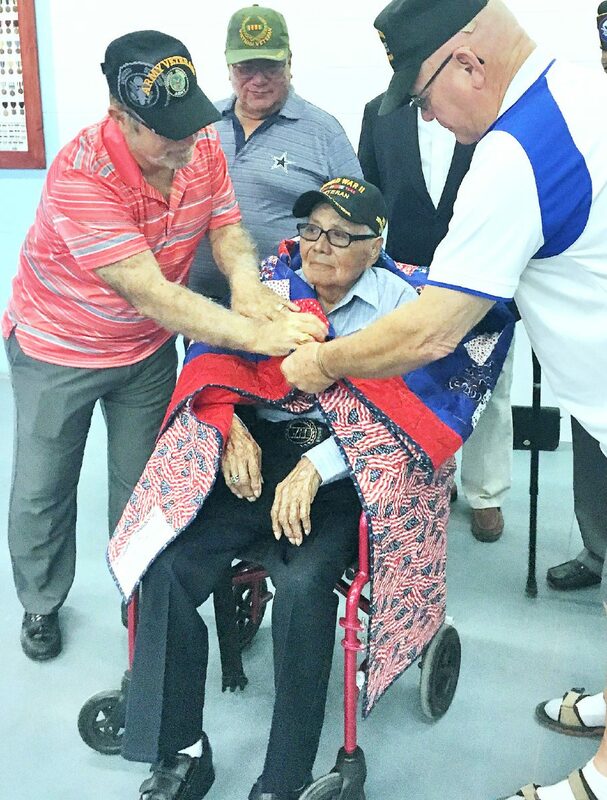 Family, friends and fellow patriots gather around Valentin Hernandez as he receives a Quilt of Valor last Saturday at the Veterans of Foreign Wars Post in McAllen. 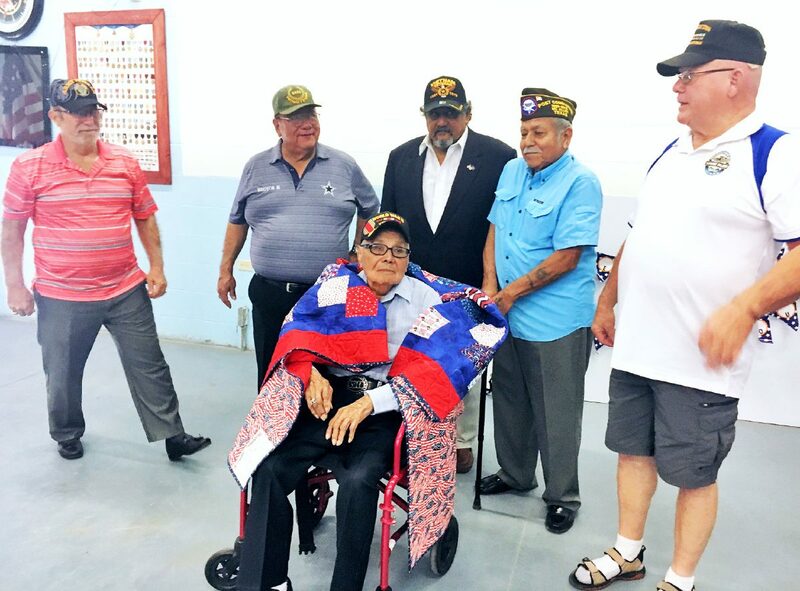 McALLEN — Surrounded by family, friends and fellow patriots here at the Veterans of Foreign Wars Post 2369, Valentin Hernandez was recognized last Saturday with what’s become an endearing honor for veterans. The 97-year-old World War II veteran from Edinburg was given a Quilt of Valor — a handcrafted quilt made by volunteers and bestowed to American veterans — for his service in the U.S. military. Hernandez entered the war in 1943 and served in the 36th infantry division as a rifleman for two years, six months and 12 days. He recalls being appointed to this position due to his wit and bravery. “You’re not afraid to fight,” he said the commanders would tell him. In addition to his bravery, Hernandez does not have a short supply of stories. His daughter, Gracie Engstrand, shared a memory her father recalls from the war, in which he was shot multiple times yet remained uninjured. Somehow, his backpack and equipment took the bullets for him. In fact, Hernandez often recalls defying death experiences, including surviving a bullet and a case of frostbite. Among his motivations to serve at the time was to obtain residency. He was brought to Weslaco from Mexico when he was 2 years old, and was guaranteed citizenship through joining the military. In his time overseas, he traveled to Italy, Germany and France and picked up a bit of the language. “Mostly curse words,” Hernandez joked. When the war came to an end, Hernandez said he was happy but also uncertain what to do next. According to another daughter, Cristela Flores, he purchased an old army truck and used it to make transports. El cortoro, he called it. Recognitions the decorated service member has received include the Good Conduct Medal. Fellow WWII veterans and Quilt of Valor recipients Merle Mickelson and Joe Reynolds were also in attendance. Nine vets in total participated in the celebration, and five of his eight children were present. Meeting and chatting with fellow WWII veterans, Hernandez said, also brought him joy in addition to receiving the quilt. “I help them and they help me,” he said, further remarking about enjoying a small photo shoot by a machine gun not unlike the one he used as a young rifleman. In the National WWII Museum in New Orleans, a brick with his name rests in a wall as another mark of history. His children spoke of plans to take him on a visit soon. To find out more about Quilts of Valor, or to become a volunteer, visit qovf.org.